There are two different scoring systems (that we know of) that get used when playing the greatest game on earth. The goal here is to explain the two systems so that you better understand them. 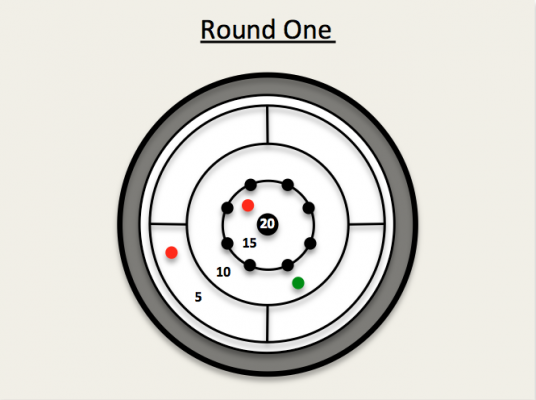 This gives you some options of how to score your next game of crokinole. Therefore, using a different scoring system is just one of the ways you can mix things up a bit and add some variety to your crokinole game. Before we dig into the scoring systems, let’s take a quick look at the point values that are the foundation of all crokinole scoring. The points that can be scored with each button or disc are 5, 10, 15 or 20 points. Check out the diagram below. At the end of each round you will count the value of the buttons left on the board and add that to the value of all the twenties that have been scored in that round. Note: if a button is touching a line on the board that divides two regions it is counted as the value of the lower region. In the diagrams below you will see four examples of how the scoring works. In each example, all shots have been taken and any discs not shown in the diagram are considered to be in the ditch and out of play. – Red has a disc in the 5 and a disc in the 15 for a total of 20 points. – Red has a disc in the 5 and a disc in the 10 for a total of 15 points. – Green has a disc in the 5 and 2 discs that were 20s for a total of 45 points. – Red has a disc in the 10 for a total of 10 points. – Green has a disc in the 10 for a total of 10 points. – Red has a disc in the 5, a disc in the 15, and 2 discs that were 20s for a total of 60 points. – Green has a disc in the 10 and 1 disc that was a 20 for a total of 30 points. We now have a handle on how to count points at the end of each round, so let’s have a closer look at the two different systems. For the purposes of this blog post we will refer to the two crokinole scoring systems as ‘Traditional’ and ‘NCA’ (National Crokinole Association). Certainly the Traditional system seems to be the most well known method of scoring. When I have the opportunity for people to tell me their stories of playing with grandparents, or at the family cottage – this is the scoring they are most accustomed to. NCA is short for the National Crokinole Association. 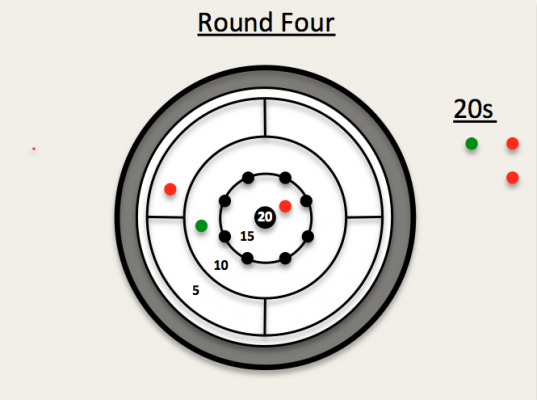 This is the scoring system used at NCA sanctioned crokinole tournaments and part of the inspiration of this blog post. Our friends over at Crokinole Centre do a fantastic job of posting videos with commentary of many of the semi finals and finals matches from the tournaments. A very frequently asked question in the comments section is people wanting to understand the scoring system used in tournament play, so this explanation should help. Revisit the diagrams from above. Round One: Red has 20 points and Green has 10 points. 20 minus 10 equals 10, therefore the score is Red – 10, Green – 0. Round Two: Red has 15 points and Green has 45 points. 45 minus 15 equals 30, therefore the score is Red – 10, Green – 30. Round Three: Red has 10 points and Green has 10 points. 10 minus 10 equals 0, therefore the score remains the same, Red – 10, Green – 30. Round Four: Red has 60 points and Green has 30 points. 60 minus 30 equals 30, therefore the score is Red – 40, Green – 30. The play continues until one team or the other accumulates 100 or more points. With this scoring system the point values above are used just as they are in the traditional scoring system. 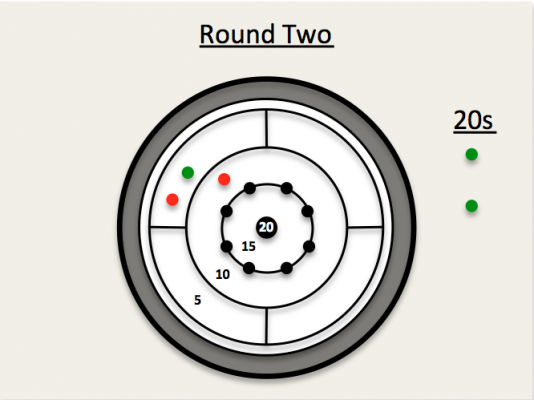 The difference is that with NCA Crokinole Scoring each round is worth 2 points. Therefore, there are 3 possible outcomes. One: the green gets 2 points and the red gets zero points. Two: the red gets 2 points and the green gets zero points. Three: red and green each earn 1 point. Finally, at the end of each round the points on the board are tallied up along with all 20s scored in that round. Whichever team has the higher score in that round earns the 2 points. It does not matter if that team has won the round by 5 points or if they have won the round by 105 points. Hence, a win is worth 2 points. A loss is worth 0 points and a tie is worth 1 point each. Now let’s have another look at the diagrams from above to see how the NCA Scoring system applies to each round shown. Round One: Red has 20 points and Green has 10 points. Red has more points, and therefore Red earns 2 points and leads 2-0. Round Two: Red has 15 points and Green has 45 points. Green has more points, and therefore Green earns 2 points and the score is now 2-2. Round Three: Red has 10 points and Green has 10 points. This round is a tie, therefore, Red earns 1 point, Green earns 1 point, and the score is now 3-3. Round Four: Red has 60 points and Green has 30 points. Red has more points, therefore Red earns 2 points and the score is now Red – 5, Green – 3. Furthermore, in round robin play at NCA tournaments a match consists of 4 rounds. In some semi final and final matches the same scoring system will be used. The difference is that it will be a race to 9 points or even 11 points. There are many other funky and fun variables when playing in NCA Tournament finals which are beyond the purposes of this blog post. (IE: The Wimbledon Rule) You can look forward to learning more in future blog posts or better yet, make your way to the NCA sanctioned tournament so you can see it live and in action. I recently learned about a variation to the traditional scoring system. Two brothers who came to their first ever crokinole tournament in Owen Sound on November 24th, 2018 told me about the rule they play by at their house. Please revisit the diagrams from above one last time! Round Two: Red has 15 points and Green has 45 points. 45 minus 15 equals 30. Instead of the score being Red – 10, Green – 30, you will subtract the 10 points that Red has from Green’s 30 points – making the new score Red – 0, Green – 20. Round Three: Red has 10 points and Green has 10 points. 10 minus 10 equals 0. Hence, there is nothing different here. The score remains the same, Green – 20, Red – 0. Round Four: Red has 60 points and Green has 30 points. 60 minus 30 equals 30. Now you subtract the 20 that Green had from the 30 that Red just scored, which makes the new score Red – 10, Green – 0. Finally, there are pros and cons to each of these scoring systems as well as some differences in strategies that will be most effective. That too, is a subject for a future crokinole blog post. So for now, grab an opponent and test out the different scoring systems described above to determine which you like the best. We’d love to hear from you so that you can let us know which is your favourite way to play! We would love to know if there is another scoring system you have used that is loads of fun. Above all, have fun playing the greatest game on earth! We used the latter scoring system in the days of yore (at home). Yes, sometimes it took awhile to end the game! Kinda miss using that system, but there are other things I miss as well. I do feel the NCA system is better. Played a tourney at my house, and used NCA scoring. I was in the finals and was losing pretty bad. Tried to even say that finals go to 9 in the championships, and I was losing. Still lost!